This new stylish pleated blind incorporates a pitch cord system that keeps even spacing between all the pleats which means the pleats in your blind look even from the top to the bottom and will always look great. The combination of low profile head and base rail with 50mm pleats creates a sleek look. When drawn up and the coordinating flush end caps gives a compact and modern harmonized look to the blind. There is a stunning array of fabrics to choose from including European jacquards, printed designs, pearlised and silver back heat reflecting fabrics. 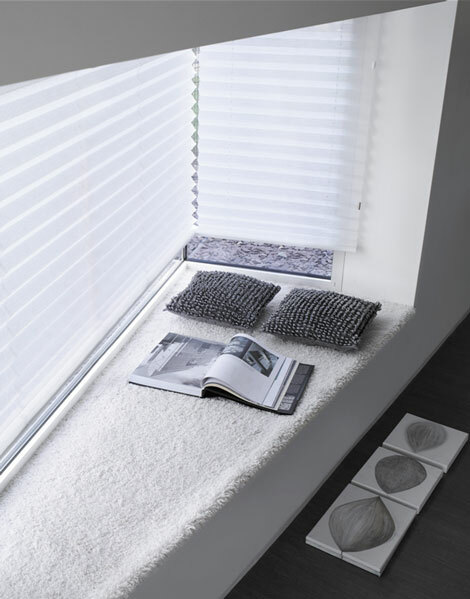 This is a great alternative to a roller or roman blind and motorisation is available.